Best Guitar Multi-Effects Pedals 2019 - Which is the Best to Buy? A Multi-Effects Pedal is a single electronic effect pedal or rackmount device that contains many different electronic effects. Different controls, modes, effects and all the advanced features are combined into one multi-effects processor and it’s here to change your musical life. Multi-Effects Pedalsare available in a wide range of designs with capabilities that can be immediately utilized by beginners and parameters that can be endlessly tweaked and perfected by professional musicians. So, if you’re looking for Multi-Effects Pedal then we can help you with some of the Best Multi-Effects Pedals 2019 that are available in the market. 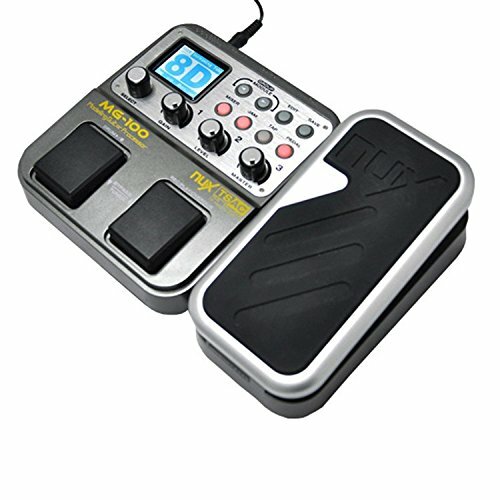 Holding the first place in the list of Best Guitar Multi-Effects Pedal, we have the Boss ME-80. The Boss ME-80 Multi-Effects Pedal offers 59 different effects and nine guitar preamps to sculpt the tones that you need for your gigs and recording sessions. With Stompbox style knobs, eight-foot switches and an expression pedal it conjures up the greatest hits from Boss’s famous collection including overdrives, distortions, reverbs, modulations and more. 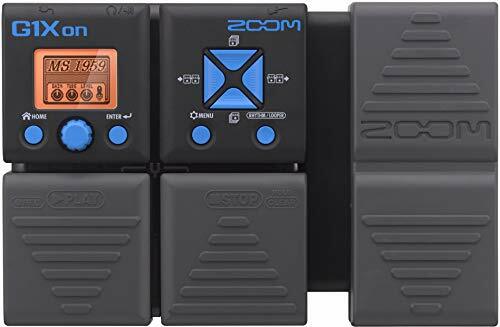 Also, This Multi-Effects Pedal uses the GT 100s flagship COSM modeling to simulate world-class amplifiers and it even has a built-in 38-second phase looper. Besides the USB audio interface lets you record to your favorite DAW and tweak tones via Boss’s tone studio software. 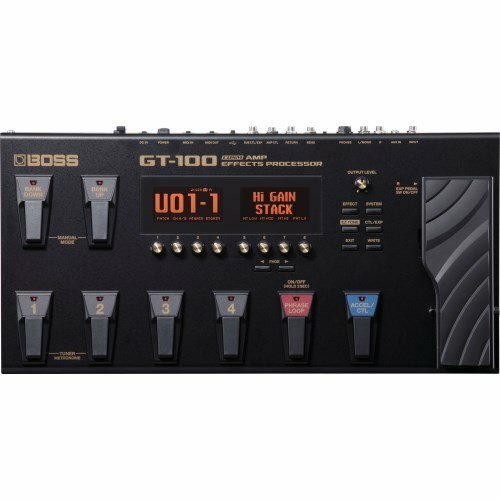 The Boss GT-100 Guitar Multi-Effects Pedal offers dual LCDs and panel knobs, which provides simple and intuitive operation with direct access to every parameter. This Multi-Effects Pedal has a unique excel pedal which offers simultaneous control of multiple parameters and comes with advanced COSM amps that model vintage classics and deliver highly expressive tones. Also, the EZ tone feature with graphical tone grid for constructing new patches plus amp customize and OD/DS customize functions for easily creating original sounds besides. The powerful a/b channel divider for creating dual amp and effects chains that can be blended or toggled by footswitch, frequency or picking strength. Moreover, it has enhanced USB audio / MIDI interface with a multi-channel operation for flexible recording and efficient re-amping. 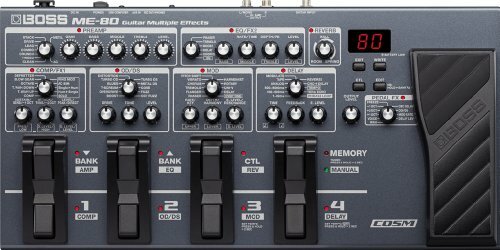 The Behringer Digital Multi-FX FX600 Multi-Effects Pedal features flanger, chorus, phaser, delay, tremolo and pitch shifter all in the mind-blowing 24-bit 40-KHz resolution that turns everyday riffs into 3d epics from your outer limits. This Multi-Effects Pedal has dual parameter control knobs they’ll let you sculpt and mold your chosen effect to perfection. also, it provides dual inputs and outputs which enable you to run your signal in mono or feed it to two amplifiers for a huge stereo sound. Besides, it is powered by a 9-volt battery or DC adapter and the in-depth controls let you create and sculpt your perfect sound. Moreover, the level control determines how much of the effect is mixed with the original signal. Another advantage is that it has a bright LED that tells you when the FX 600 is activated and the first class on/off switch maintains incredible signal integrity in bypass mode. 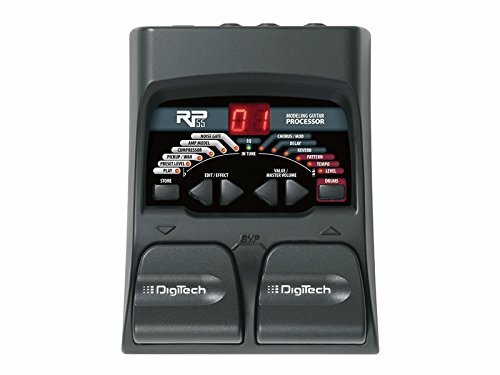 The DigiTech RP55 Guitar Multi-Effects Processor is equipped with 11-amp models and 20 studio quality effects. Up to 8 effects can be used at once for unimaginable possibilities. You can dial up your choice of amps and preset effect settings with no deep parameter settings. The uses an audio DNA DSP chip to produce results and amps that our studio class. Also, you can add 24-bit a/d /a conversion so that no frequency response is lost between inputs and outputs. Besides, the included is a drum machine with 30 patterns and an easy-to-use 13 LED chromatic tuner. It has a compact 2-footswitch that lets you use up to 8 effects at a time and it’s easy to pull up the settings you like. Moreover with 40 factory presets you’ll find plenty of great sounds in this compact and affordable RP 55. The Zoom G1Xon Guitar Effects Pedal provides 100 great sounding multi-effects and includes a built-in expression pedal perfect for increasing overdrive, changing volume or adding Wah or filtering to make your guitar sing. This Multi-Effects Pedal allows you to use up to five effects simultaneously. Plus, there’s a built-in chromatic tuner a looper and 68 rhythm accompaniments. Also, it will enable you to select and edit any of its onboard effects and it allows you to use up to five of them simultaneously chained together in any order you like. You can layer up to 30 seconds of performance through the effect or effects of your choice. Besides, the looper can even be used in conjunction with rhythm accompaniments so that you can play along with the pattern of your choice. Plus 68 built-in rhythm accompaniment patterns and an onboard chromatic tuner and looper and take your guitar playing to a whole new level. The NUX Multi-Effects Pedal Processor offers all guitar effects including a variety of distortion, compression, modulation, delay, reverb, amplifier and cabinet models. It comes with a user-friendly interface, which you can reach the main controls easily by using the gain level and master knobs on the front. Also, the high-resolution TFT LCD screen allows you to control and adjust everything clear and precise. Besides, the built-in expression pedal can be used as a volume pedal or assigned to monitor any selected parameter in real time. Moreover, the rhythm function can also be used with the 40 seconds looper function, allowing you to jam with unlimited overdub layers and countless hours. Another advantage is that it has 13 classic amp and 11 speaker cabinet modes, which are powered by knux TF/AC technology.